Each year, our Gala serves as one of Noor Family Services' largest fundraisers. Funds raised during this event - from ticket sales, silent auctions, giving trees and donations - help us continue to serve our all-important mission to to fill a need in the community for confidential, culturally-sensitive services and assistance to clients experiencing crises due to family violence and abuse. Our programming - pro-bono legal services, counseling, case management, support group, and financial assistance helps so many victims and survivors of domestic violence leave abusive environments and gives them hope. 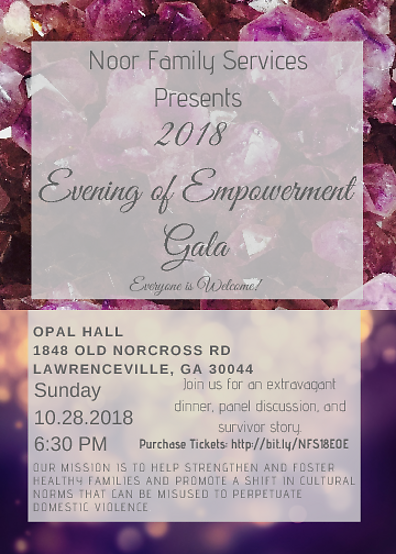 Our Gala includes a lovely seated dinner, panel discussion, silent auction, and countless opportunities to celebrate the good that's being done on behalf of Noor Family Services victims and survivors. Edit This Event Last Edited By: Noor Family Services on Oct. 5, 2018, 2:28 a.m.